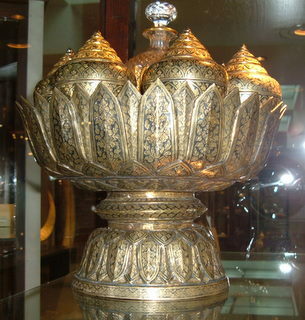 Rattanakosin antiques refer to the Thai pottery produced during the Rattanakosin era when Bangkok was established as the capital of Thailand during the reign of the Chakri kings from 1782 to the present day. 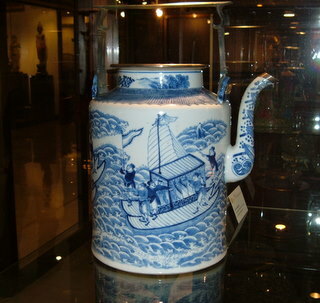 These antiques were displayed in an exhibition in River City, an art and antique center in Bangkok, in September 2007. Most of them were from private collections. 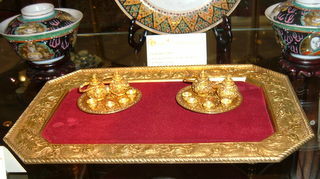 Here are some of the photographs of these antiques which are hardly ever used today except for display and ceremonies. In the reign of King Rama III (1824 – 1851), trade with China flourished. So did cultural exchanges; Chinese architecture, pottery, art and sculpture became popular. 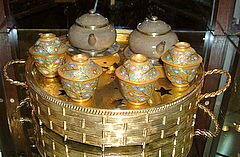 The strong Chinese influence on Thai art and culture is evident from the temple architecture and decorations in the Third Reign and these Chinese tea sets. What are your favorite Bangkok photographs? Share your special travel pictures with us here. 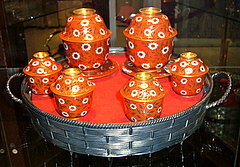 Benjarong, the renowned Thai ceramics in five (benja) primary colors, was originally designed in Thailand and sent to China to be produced. 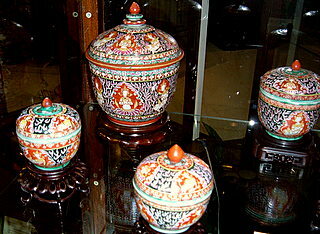 This was because the nobility then had a greater preference for Chinese pottery than the local version. Betel chewing was a popular habit in those days as in some other south-eastern countries. This daily ritual wouldn't be complete without the containers to hold the betel leaves and condiments. The complete set shown below is in gold and studded with diamonds. 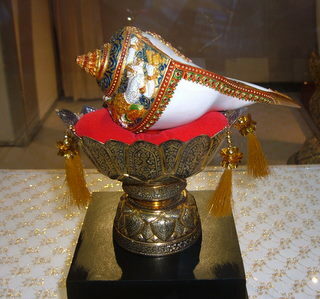 The ceremonial conch shell is used during wedding ceremonies to pour water over the joined hands of the bride and bridegroom as part of the customary blessings from the elders. 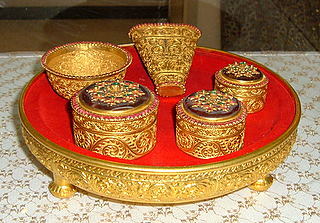 Neilloware or krueng thom is an elaborate Thai handicraft. Floral and other designs are etched on gold or silver surfaces and coated in a metallic amalgam. This is illustrated in the gold and neillo cosmetic set in a bowl shaped like a lotus flower in full bloom. The glass container in the center is probably for perfume. Little wonder that the theme of this exhibition on Rattanakosin antiques was the "Glory of Rattanakosin." For more Bangkok photographs. For examples of exquisite Thai handicraft, please see Traditional Thai Art which features various forms of Thai art and craft.